Last month our car tabs were up for renewal in Washington State. 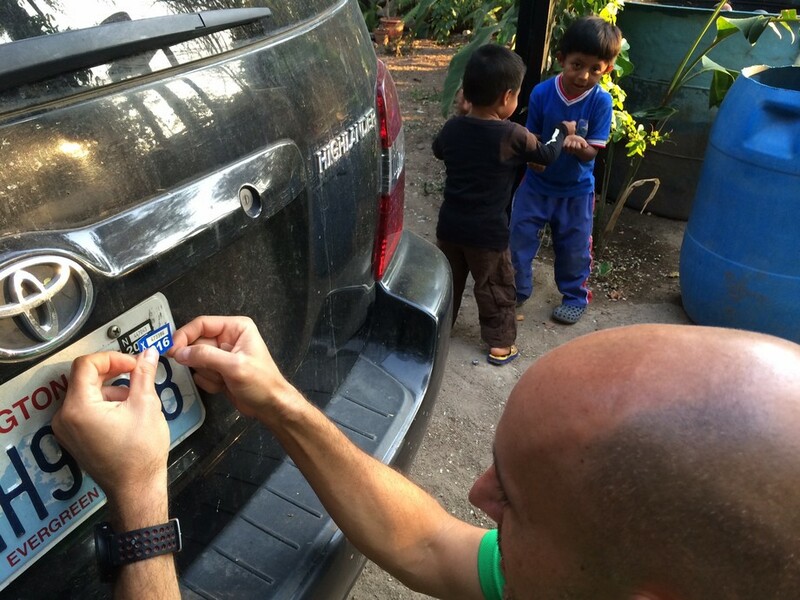 Even though our car is in Guatemala it's important to keep the license plate tabs up to date in order for it to be fully legal. The last thing I want to do is give my family a reason to be hassled (or even turned away) at a border crossing. We had friends from Washington coming to visit so I began the process of renewing our tabs online and mailed to our address in Washington. They'd bring the new tabs when they came to visit. Easy and straightforward. As I was completing the renewal online I hit a snag...a snag that turned into a benefit. My car was up for a required emissions check. Oops! So far as I know Guatemala does not check emissions on anything, plus my car would have to be in Washington to get tested. After spending a few minutes on the State's website I found a form I could fill out that would exempt my car from testing because it's "Out of the Testing Area". Best of all I was not required to pay for the emissions test, just the standard registration fee for the tabs. SCORE! Applying my recently delivered car tabs. Another way we've saved money is on car insurance. We don't have any. This may sound nuts but it is not required in Guatemala and very few people have it. Our car is securely locked up every night and when we drive it we are always alert since road conditions can be unpredictable. Having the Toyota logo peeled off the front of the car while it was parked in a public lot has been the only thing that's happened to the car to date. And that is minor wear and tear compared to Mick driving the car on a daily basis in the States. Do you remember our back bumper? Even though gas prices in Guatemala are about 30% higher than they are in the US we're spending less money on gas. We don't use the car on a day to day basis. We only drive when we're headed to Guatemala City or to a distant destination which averages out to only driving the car a few days a month. We walk or take public transportation all other times. 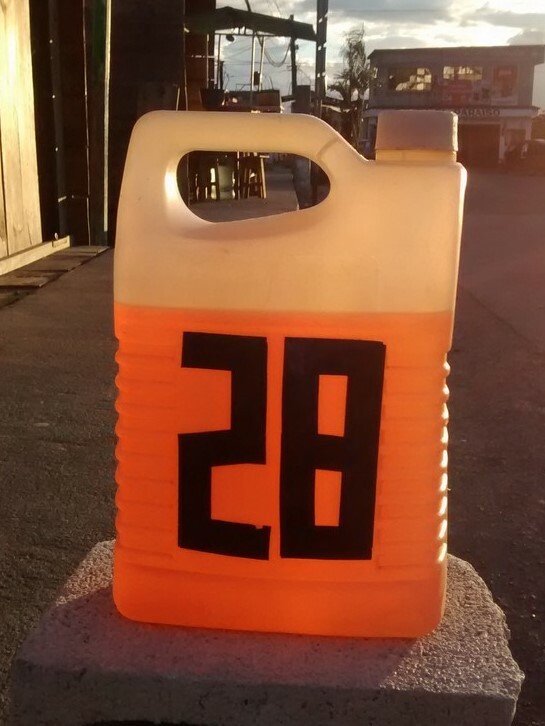 Gas is commonly shipped in from Mexico and sold at homemade gas stations. The picture above advertises their price. Lastly, another great way we've lowered our auto expenses is through our mechanic. Yes, we have a trusted mechanic. He's given our car a full tune-up and changed all of the brake pads for a song. Toyota parts are readily available and the labor rates are 10-20% of US prices. The only gotcha was that we had to wait an extra day for the mechanic to get transmission fluid (there aren't that many automatics in this country). On the flip side, there is one drawback to having a car with US plates...it requires a temporary car permit that has to be renewed every 90 days. Fortunately we've found an office that does this free of charge in Guatemala City. Without this option we'd have to leave the country with our car for 72 hours every 90 days. It was a good find. Thanks for reading! If you enjoyed this, does us a favor and click the Like or Share buttons below, or leave us a comment.